Get ready, everyone! We've got an absolutely stellar Saturday of racing coming up on July 9th, led by six graded stakes races at Belmont Park, four at Arlington Park, and a wide mix of other exciting races. Leading the way are the $1.25 million Belmont Derby (gr. I) and $1 million Belmont Oaks (gr. I), which will be shown live along with the Suburban Handicap (gr. II) during a 1 ½-hour broadcast on NBC Sports. The fields are deep and competitive, and I think there's a chance for some major longshots to reach the winner's circle. Let's start handicapping! Trainer Aidan O'Brien has won many big races in the United States and will send out two quality colts in search of glory in the Belmont Derby. Deauville could draw a lot of wagering support off his narrow defeat in the Dante Stakes (Eng-II) at York, and the firm course at Belmont should suit him well, but stablemate Long Island Sound-third in the Tercentenary Stakes (Eng-III) at Royal Ascot behind subsequent group I winner Hawkbill-could be a better choice among the O'Brien shippers. Humphrey Bogart, a Richard Hannon-trained runner that finished fifth in the Investec Derby (Eng-I), is another to consider, although it's worth noting that Hannon and his father, Richard Hannon, Sr. are a combined 0-for-20 with their U.S. starters. There's a good chance that one of these international shippers will prevail, but I'm going to take a shot with Highland Sky. I liked him in the Breeders' Cup Juvenile Turf (gr. I) last year, in which he finished a solid sixth at 17-1, and he's taken a nice step forward to finish first or second in all three of his races this year. Two starts back, he overcame a wide trip and a slow pace to win the Woodhaven Stakes at Aqueduct with a determined late run, and last time out, he endured a very tough trip in the nine-furlong Pennine Ridge Stakes (gr. III) at Belmont, being compromised by a slow pace and a wide trip once again. Despite these obstacles, he ran his final three furlongs in about :34 flat to fall a neck short of catching the ground-saving winner Camelot Kitten, and according to Trakus, Highland Sky ran 45 feet more than the winner, a huge sum that equates to roughly five lengths. With an off-the-pace runner like Highland Sky, there's always a chance of encountering a troubled trip, and he could certainly endure another troubled run on Saturday. But if he can save ground from post four and find an opening turning for home, I think he'll have every chance to win at 8-1 or more. A deep and talented field of 13 three-year-old fillies will head to the starting gate for this million-dollar race, with the favorites including Catch a Glimpse, winner of seven straight races, and the European shipper Ballydoyle, runner-up behind Minding in the QIPCO 1,000 Guineas (Eng-I) at Newmarket earlier this year. I have a ton of respect for both of these fillies, particularly Catch a Glimpse, a seemingly uncatchable front-runner who could get a lonely lead in the Belmont Oaks and quite possible take this field all the way on the front end. It's also worth noting that Ballydoyle has had a somewhat troubled spring; after missing the Investec Oaks (Eng- I) due to an illness and the Coronation Stakes (Eng-I) at Royal Ascot due to the soft ground conditions, she ran in the prestigious Prix de Diane (Fr-I) at Longchamp, where she encountered soft ground and ran sixth. Ballydoyle probably wasn't at her peak for that race but was only beaten 3 ¼ lengths, and she could be rounding into better form for the Belmont Oaks. But on the other hand, trainer Chad Brown has won the last four editions of this race-twice as the Belmont Oaks and twice when it was the Garden City Stakes-and I think he can win it again with Last Waltz. She was compromised by a slow pace when third in the nine-furlong Wonder Again Stakes last month at Belmont, and it's worth noting that fillies that prepped in the Wonder Again have swept the exacta in the 2014 and 2015 editions of the Belmont Oaks. I think Last Waltz is getting good at the right time and will relish the ten-furlong distance of the Belmont Oaks, and if she can work out a better trip than last time out, I think she can post an upset at 30-1. When I look at the entries for this seven-furlong sprint, almost every horse I see has early speed. Anchor Down, Private Zone, Roxbury N Overton, A. P. Indian, and Green Gratto all tend to race on or near the lead through fast fractions, and it's hard not to envision a very fast pace setting the race up for a closer. Joking won the six-furlong True North Stakes (gr. II) at Belmont on June 10th, producing a big late run to rally and win by a neck in a 10-1 upset. He might be seven years old and a veteran of 38 starts, but this gelding seems to be getting better with every race this year, and he's never finished out of the exacta in eight starts at Belmont, winning five of them. It could be tough to reel in Private Zone, who won this race by 3 ¼ lengths last year, but Private Zone will be making his first start of the season, and if a blazing pace unfolds, I think Joking can come running to post another upset. I'd also like to mention A. P. Indian, who won the seven-furlong Donald LeVine Memorial Stakes three weeks ago at Monmouth Park. A very consistent runner with a lot of early speed, he finished just 1 ¼ lengths behind Delta Bluesman in the Decathlon Stakes at Monmouth two months ago, and Delta Bluesman has come back to win two races, including the Smile Sprint Stakes (gr. II) at Gulfstream Park. If not for a troubled trip, A. P. Indian might have beaten Delta Bluesman in the Decathlon (he was actually placed first when Delta Bluesman was disqualified for interference), and in the event that A. P. Indian avoids getting involved in a speed dual, I think he has a chance to win or hit the board at 10-1. 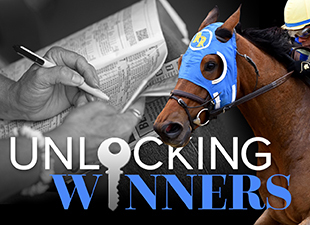 I usually focus my Unlocking Winners analysis on stakes races, but as an extra bonus for this week's blog post, I've found an unraced filly in a maiden special weight that I believe warrants a close look. Over the last two years, trainer Michael Doyle has been simply fantastic with two-year-old first-time starters at Woodbine, particularly those ridden by jockey David Moran. Just last week, Doyle scored a 22-1 upset at Woodbine with a Moran-ridden filly named Stormy Perfection, and on Saturday, Doyle will send out another two-year-old debut runner named Gaelic Rebellion in Woodbine's fifth race. Her workouts are very similar to the ones posted by Stormy Perfection, and she meets a field that doesn't look very deep on paper. David Moran will be aboard, and if Gaelic Rebellion goes off at anywhere near her morning line odds of 12-1, I think that's fantastic value. Now it's your turn! Who do you like on this great Saturday of racing?